Depart Nairobi for Samburu National reserve arriving in time for lunch. Afternoon game drive. Dinner and overnight stay at Samburu Sopa Lodge or similar. 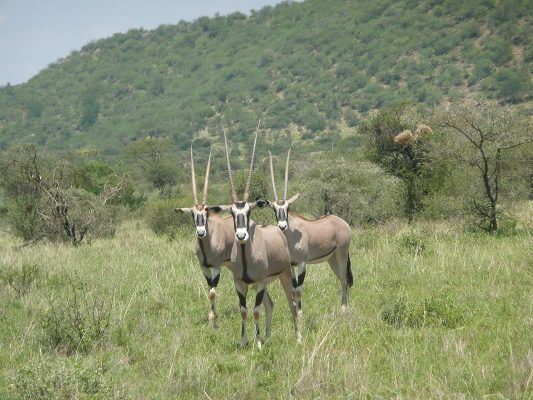 Day 2: Have Full Day Game Drive or morning and afternoon game drives in Samburu National Park. All meals and overnight stay at Samburu Sopa Lodge or similar. Depart Samburu after breakfast and leave for Lake Nakuru arriving in time for Lunch, game drive until late afternoon, later depart back to the Camp/Lodge for Dinner and overnight stay at Nakuru Lodge/Flamingo Camp/Sarova Lions Hill Game lodge. After an early breakfast drive to Lake Naivasha, have a Hike at Hell's Gate with picnic lunch, afterward drive to the Camp/Lodge in the afternoon, you will have an Optional Sun downer boat ride to Crescent Island well known for its bird life. Dinner and overnight at Naivasha Sopa Lodge or similar. Have Breakfast and leave for Masai Mara arriving in time for lunch. Afternoon game drive. Dinner and overnight stay at Masai Mara Sopa Lodge or similar. Early breakfast and depart with packed lunch for a full day of game viewing and exploring the Mara Plains This game reserve is Kenya's finest wildlife sanctuary. Including migrants, well over 450 species of animals have been recorded here. Although July, August and September are the months when the Mara plains are filled with migrating wildebeest and zebra, there is also resident wildlife year round. The famous Maasai tribesmen live within the dispersal area of the game reserve. Meals and overnight at lodge. Early morning gamedrive then back to the lodge for breakfast. After breakfast start journey back to Nairobi, make a stopover at Narok town with a chance to buy a souvenir or a cup of tea to arrive back in by late afternoon.